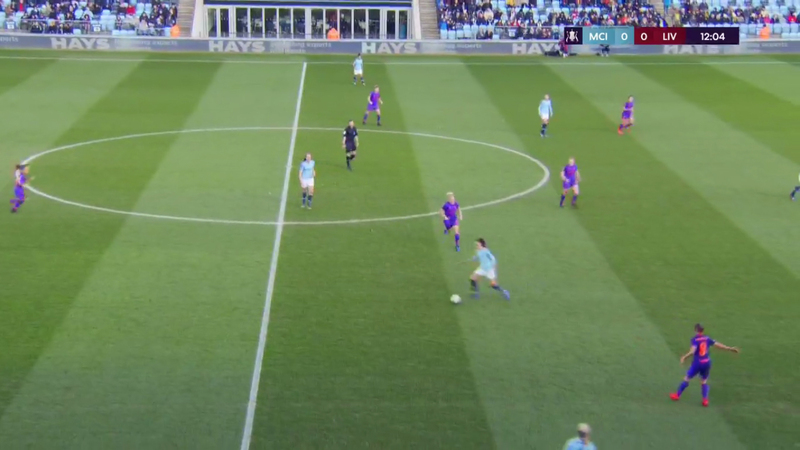 Undefeated in the league, Manchester City Women go into this quarter-final undoubted favourites against a Liverpool side struggling in lower mid-table, having lost many of their players to the Mancunian clubs. Nick Cushing set up his team in a 4-4-2 formation, with Janine Beckie partnering Nikita Parris in attack, while Vicky Jepson opted for a 4-5-1. 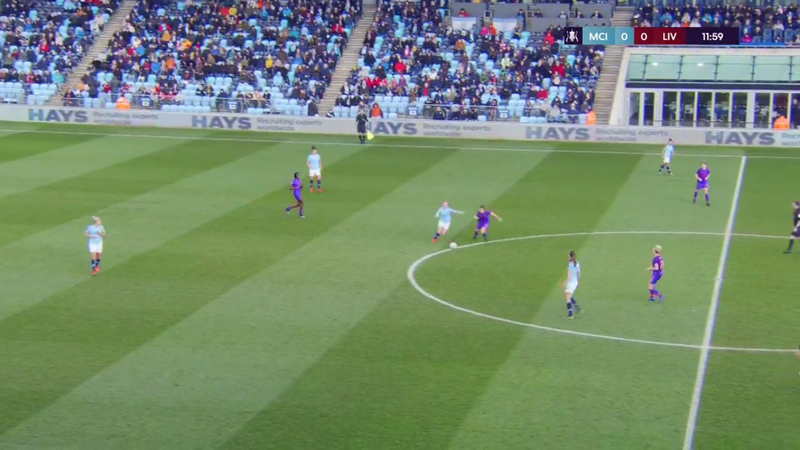 Liverpool understandably set up quite defensively against the superior City side, dropping back into their own half to try to force City to play through them, although this ended up being quite easy for the hosts to do. Not wanting to surrender all control to City, Liverpool were still pressing, although this wasn’t a very effective way of regaining the ball. 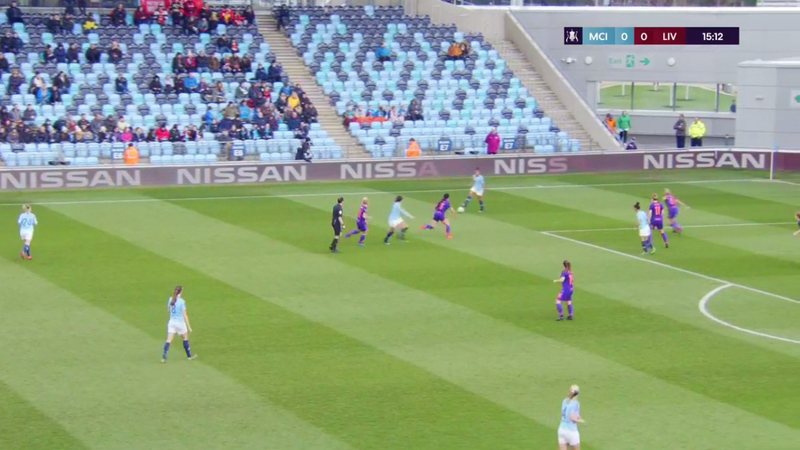 Rinsola Babajide would close down one of the City centre-backs, however they would split wide, making it easy to simply wait for Babajide to get close to them before recycling the ball to the other one in space. 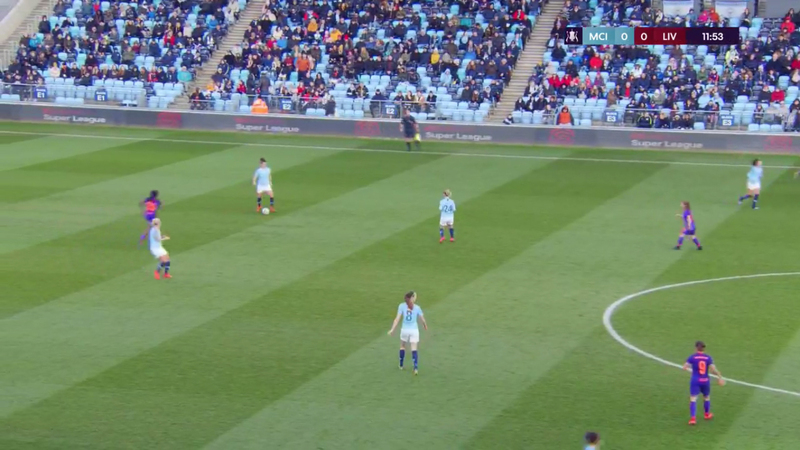 In midfield, Laura Coombs and Christie Murray would push up and get tight to Jill Scott and Keira Walsh, stopping them getting on the ball in space, however them getting pulled forward would leave Amy Rodgers having to cover a lot of space between the lines. Tessa Wullaert and Caroline Weir were both comfortable tucking inside and Parris and Beckie were happy to drop off the front, leaving Rodgers with too many and often varying opponents to keep track of. Coombs and and Murray pushing forward would stretch the team too much vertically, giving City lots of space to play forward, but if they didn’t Scott and Walsh would have time to pick out long passes forward. Walsh in particular was picking out some excellent passes whenever she had time. City also progressed the ball well down the flanks. 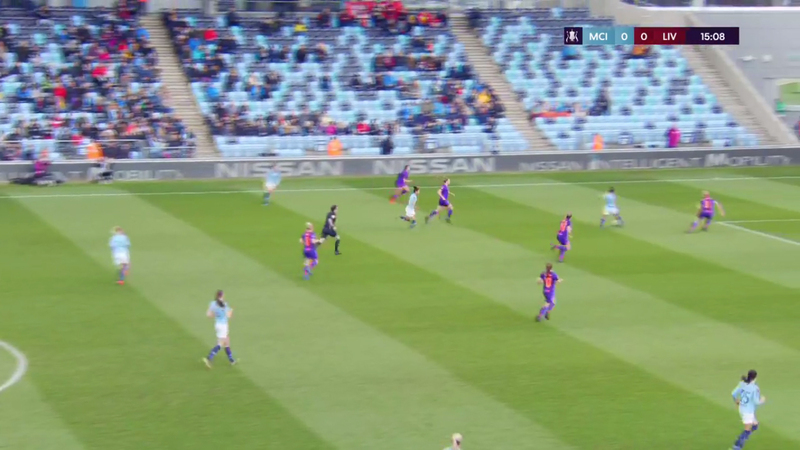 This was mostly down the left at the start, using the pace of Demi Stokes from full-back, however they started to use similar tactics down the right shortly before their opening goal. 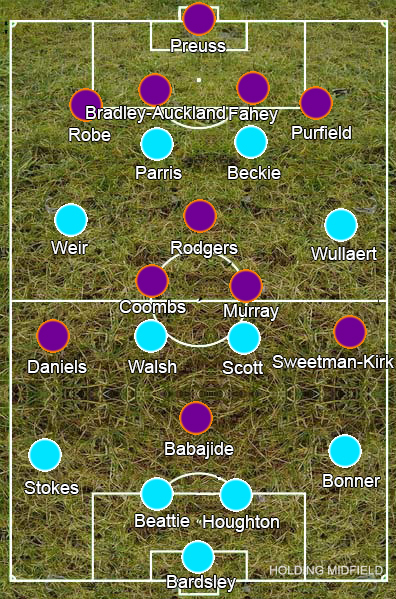 City would play the ball wide to a player, usually the winger, relatively deep in attack to drag the Liverpool full-back up the pitch while an attacker would make a run into the space the full-back had left and the other wide player, typically the full-back, would attack the space in support. With quick interchanges of passes between the three, Liverpool found it difficult to keep up with City. City took the lead with a swift counter-attack from a throw-in. They won the ball in the air then Scott took control of the bouncing ball, shrugging off the challenge of Coombs to stride forward into space with Rodgers distracted by Beckie. Niamh Fahey is forced to come out to confront Scott, which in turn forces Sophie Bradley-Auckland across to cover as Parris attacks the space behind her. 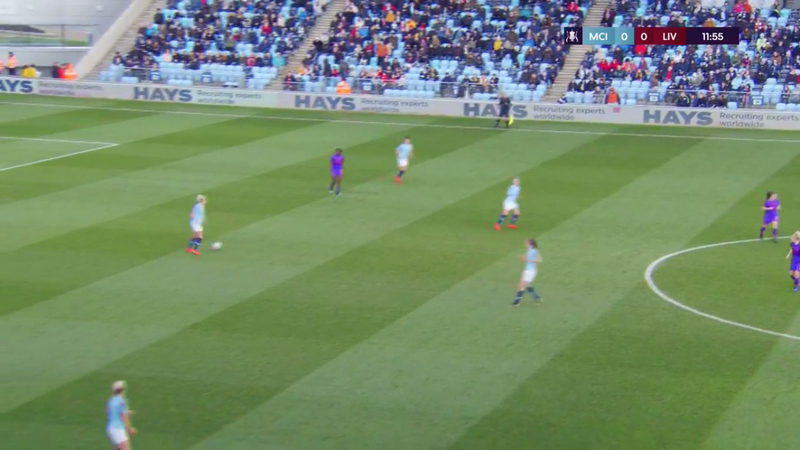 Scott plays the pass behind Parris, forcing her into the wide area where Bradley-Auckland has her under control, however Jemma Purfield comes across to double up on Parris rather than filling the gap the centre-back has left in the middle. 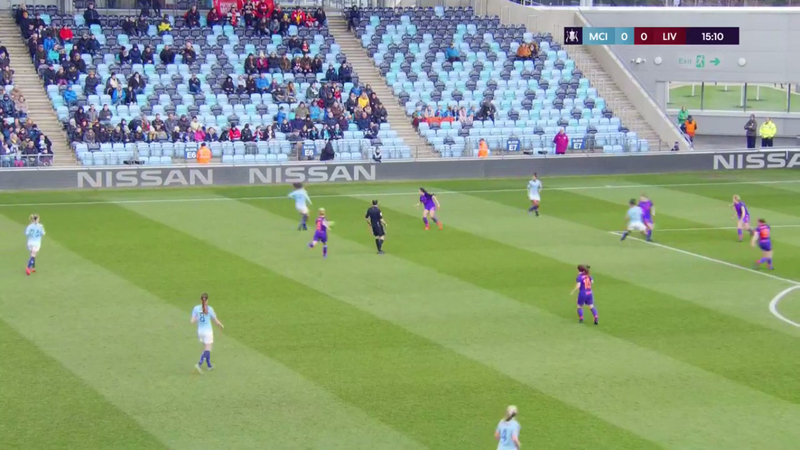 Beckie quickly notices the gap and runs into it, Parris sliding a through ball between the two Liverpool defenders, squaring the ball to Weir despite being in space, only to recieve it back again and finish herself. Liverpool struggled to threaten City. The ball was mainly sent up to Babajide, who was rarely able to hold up the ball for long enough to receive support. 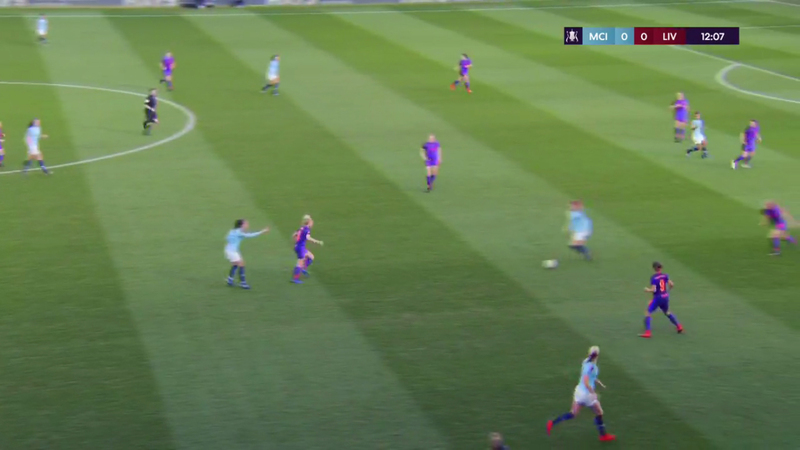 City had a good base of the two centre-backs and midfield pair, making it hard for her to keep hold of the ball, while Liverpool were dropping so deep out of possession that Courtney Sweetman-Kirk was often left having to run the length of the pitch to get in an attacking position. 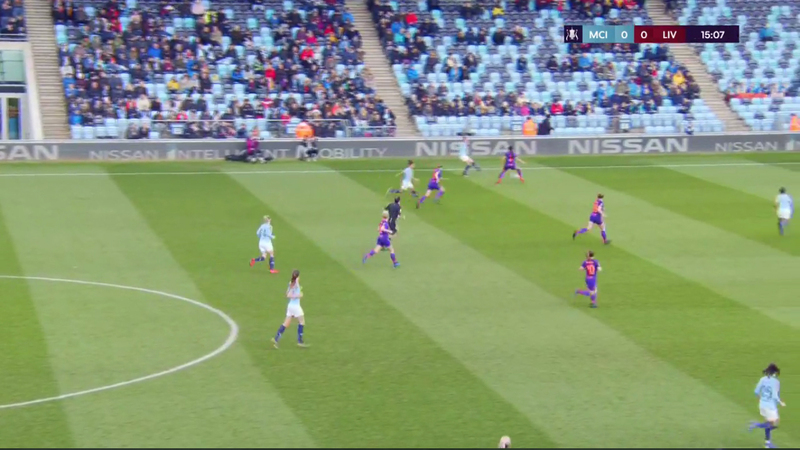 After going behind, Liverpool engaged City slightly higher up the pitch and sloppy passing on City’s part often allowed them to win back the ball in City’s half, but the hosts remained in complete control. Substitute Georgia Stanway managed a brace to seal City’s win – first from a counter following a poor Liverpool goal kick then a tidy finish from outside the box late on – sending them through to a semi-final against Chelsea. You can watch the match in full for free here.